Restless Leg Syndrome is a nervous issue that affects more than 20 million people. The condition causes an irresistible need to move one’s legs. It is most obvious and most problematic during sleep. In fact, the need to move the legs is only relieved for a few minutes after moving the legs. This repetitive disturbance of sleep can cause terrible insomnia and poor sleep. This type of issue has a devastating impact on health, ability to work and disposition. Presently there is only one pharmaceutical that claims to relieve this issue and it does not clearly work in all cases. There is no herbal tonic or capsule or any dietary supplement that has shown broad success. This condition does not appear to be caused by any identifiable dietary deficiency that can be remedied with functional foods or supplements. The combination of herbs described herein is designed to support the body to attack the issue on a number of different levels and represents a unique therapy. Although individually, these herbs have popular uses, the combination of the herbs in this way to address this issue represents a multi-dimensional approach to an elusive issue. Leg Relaxer works by applying a soothing and restorative herbal decoction directly to the area where discomfort and restlessness are occurring. This decoction is made into a lotion and then put in a convenient roll-on bottle. Why take a pill when you can apply the appropriate constituents directly to the site of the issue? These ingredients Wild Yam, Lavender, Sage, St. John’s Wort, Peppermint, and Rosemary. These offer the most nerve soothing action that can be delivered herbally. All of these herbs act together and support the body to relax and restore muscles and nerves that are in need of help and attention. They offer a natural means for assisting your body in its recovery from over-work and long days. You can sleep peacefully tonight, without restless legs keeping you up. Hi, my name is Steve Frank. I’m the herbalist for Nature’s Rite and believe it or not, I suffer occasionally from Restless Legs. My feet sometimes need to move, continuously. I tried supplements, massage and exercise none of it worked. They really mostly did this at night. It was hard enough to notice, but it kept me from falling asleep. One night while I was stretching my feet to try and satisfy them (I knew it wouldn’t work, but I felt I had to do something) I was thinking about what herbs I would use to get them to settle down. Well, first off, I should use some herbs to relax muscles. Then, some herbs to quell excess nervous activity would be in order. And finally, I really should put some herbs in there that are traditionally used to soothe muscles and increase lymphatic and blood flow. One night while I was stretching my feet to try and satisfy them (I knew it wouldn’t work, but I felt I had to do something) I was thinking about what herbs I would use to get them to settle down. Well, first off, I should use some herbs to relax muscles. Then, some herbs to quell excess nervous activity would be in order. And finally, I really should put some herbs in there that are traditionally used to soothe muscles and increase lymphatic and blood flow. “That oughta do it..” I thought. As I laid there going over herbs to perform this function it occurred to me that I already had done this. 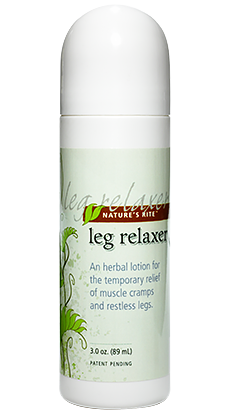 I had made a product for my Mom’s leg cramps that had some great herbs to perform these functions. Boy did I feel foolish for not having realized that sooner. I got out of bed, felt my way into the other room and found a bottle of Leg Relaxer. When I got back in bed, I rolled some on the bottoms of my feet, let it dry and got back under the covers. At first, I laid there in disbelief. My feet had stopped “gripping.” They didn’t need anything. They were happy just being there. No wiggling, no gripping, nothing. Well that was the last thing I remember before waking up the next morning. Ah, a good night sleep. What a blessing. Since then, I’ve used Leg Relaxer many, many times to quell that “need to move”. Many other people have become believers and customers as well. We’re all enjoying the wonderful combination of herbs that get your legs to settle down and sleep tight. You should join us. Get a bottle today and give it a try. You’re gonna love this stuff. You have my word on it.